Your guttering woes are not limited to rainy weather. During the summer season, Australia’s hot and dry climate can also pose a danger to your home. Bushfires that cause extensive damage to life and property are very frequent during the warmer months of the year. And with global warming, these bushfires may increase in frequency and severity. During bushfire season, it is essential that your home is protected from potential damage. According to the NSW Rural Fire Service, most houses burn from bushfires through flaming embers. Embers are small fire particles that travel through the air. When embers come into contact with combustible materials, they cause the devastating fire that can destroy your home. The most common combustible materials found in homes are the dried leaves and debris that get stuck in a not so well-maintained gutter. The process is fast. Since dried old leaves can quickly catch fire, your home can be engulfed by flames in minutes. Unfortunately, bushfires are a natural part of our ecology. A lot of Australian plants and trees rely on these bushfires to reproduce and regenerate. While this natural phenomenon cannot be averted, the damage that it can cause to homes can be minimised. To ensure that your home is protected, the Australian government has developed a set of standards for buildings in bushfire prone areas. The government recognizes that traditional gutter guards do not have the capacity to prevent embers from lighting dried leaves on fire. What are Ember and Leaf Guards? Ember and Leaf Guards are special attachments to a guttering system that prevents embers from igniting combustible materials. Compared to traditional gutter guards which only minimizes the access of dried leaves and debris, ember guards limit flying embers from reaching your roof cavity. 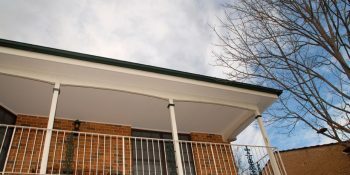 Easy Fall Guttering has created a gutter system with an innovative leaf and ember guard that completely mitigates the damage caused by bushfires. The Easy Fall Leaf & Ember Guard provides the best protection for homes located in bushfire-prone areas. Designed to prevent litter build up that can become fuel for flying embers, our leaf and ember guard allows rainwater to run down the gutter while keeping leaves and debris from getting stuck. We have achieved this through our shallow dish design that lets gusts of wind blow away dried leaves easily. Our ember and leaf guard has been independently tested by the Commonwealth Scientific and Industrial Research Organisation according to the AS/NZS 1530.3:1999. Our system is rated ZERO, the highest fireproof rating, in compliance with the government’s bushfire regulations. The Easy Fall Ember & Leaf Guard is powered by COLORBOND® Steel, making it unmeltable by burning embers. It also comes with a 25-year warranty against rust and guaranteed to fit any existing type of guttering that you may have. Protect your home from the devastating effects of bushfires. Get the Easy Fall Ember & Leaf Guard today. Call us today on 1800 897 444.